Khojali was a small Azerbaijani town that boasted the only airport in Nagorno - Karabakh. A prime target for the Armenians, it was shelled from 1988 onward, until it became the scene of an unbelievable nightmare - a massacre that happened virtually overnight on February 25 and 26, 1992. Those who returned to the massacre site days later found evidence everywhere of a massive slaughter. There were mutilated bodies of men, women and children-some of them shot in the back or in the head at point-blank range, some with their skin peeled off, some with body parts missing. Elman Mammadov was head of the Khojali Executive Board and was responsible for the armed and self-defense detachments in that region. He was in Khojali when the massacre happened and helped the survivors escape to Agdam, an Azerbaijani town 15 miles away. Here he describes the unimaginable horror of those days. The attack on Khojali was precise and extremely well-organized. At about 7:30 p.m. on February 25, I was informed by our remote post in Noragil that they had seen infantry units moving in the direction of the village. I quickly checked with the other posts to see what was going on. During the next 10 minutes, I received reports from the other lookouts, all saying that Armenian troops and tanks were moving towards Khojali from various directions. I sounded the alarm and went to our headquarters. We gathered our forces and got ready to defend ourselves. It took them about three hours that night to surround Khojali, from 7:30 until 10:30. It was a carefully planned military operation. Of course, the Armenians couldn't have done it without help and support from Russia. The 366th motorized infantry brigade of the Russian Interior Ministry forces, stationed in Stepanakert (capital of Nagorno-Karabakh called by its pre-Soviet name Khankandi since independence in Azerbaijan) at the time, helped the Armenians carry out their invasion. That supposedly neutral regiment also supplied them with all kinds of weapons. Enlarged area of Nagorno-Karabakh showing Khojali in relation to Aghdam where many people fled the night Khojali was attacked. We didn't have any kind of heavy military equipment - the largest weapon we had was a machine gun. For three hours, we tried to warn Agdam, Shusha and the other villages in Karabakh about the attack on Khojali. We asked for help, but couldn't get any. At about 11 p.m., they started firing. It was as if all of their tanks and machines started firing at the same time. The artillery fired down on us like rain. All of the newly built Finnish and Czech houses of wooden construction burst into flame. The people trapped inside were burned alive. 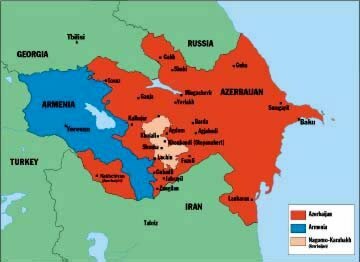 Nagorno-Karabakh (NK) in relationship to Azerbaijan (red) and Armenia (blue). NK along with seven surrounding regions has been militarily occupied by Armenians beginning in 1992. Everyone was in shock. I still remember how the old people, women and children started crying, screaming and running in a panic. Their voices still echo in my ears. I don't think I'll ever forget it. We tried to defend ourselves against the Armenian attack, but we were no match for their forces. It was impossible for us to defend ourselves against a convoy of tanks and armored personnel carriers. The town was completely destroyed. There were already a large number of casualties. By 3 a.m., we knew that no one would survive if the well-armed Armenians entered Khojali. There was no other choice - we had to escape. We were trapped on three sides, so our only option was through the forest. The road was controlled by the Armenians. We helped the people cross the shallow river; Alif Hajiyev, head of the Khojali airport, and I were the last ones across. The people waited for us on the other bank; once we were both there, we decided to serve as guides for them. That year the winter was quite severe. The forest was covered with snow. Many people were barefoot, without any warm clothes on, since they didn't have time to bring anything with them. Just imagine-they had to cross an icy cold river and then walk through a snowy forest. Many died from exposure; others ended up with severe frostbite. In the forest, we kept trying to contact a nearby village, Agdam, using our walkie-talkies. We wanted to tell them about our situation and ask them to send people to help us or to organize an attack in the direction of Askaran. We were hoping that the Armenian forces would go and deal with that attack, leaving the road from the forest open for us to pass. But we couldn't get any help. I'll never forget what happened to Telman Orujev. As my wife was escaping through the forest, she heard a child crying, but couldn't figure out where the sound was coming from. She couldn't see a baby anywhere. Then she realized that the cries must be coming from underneath Orujev's dead body. He had been wounded in the chest and fallen backwards to the ground. She went up to him, turned his body over and found a baby. When they were fleeing, Telman had tied his three-month-old baby on his back. The poor child was trapped beneath him. My wife passed the baby to one of our soldiers. Today the child lives with his grandmother. About two to three kilometers away from Agdam, near Nakhchivanik, we reached the end of the forest and found ourselves in a large open area. What we didn't realize was that it was an ambush - the Armenians were waiting there in trenches for us. They knew that any survivors would have to pass that area. By that time, it was already early morning and just starting to get light out. In a situation like that, there's no time to think about what to do. A few of the other men and I tried to cover the others by firing our weapons. We divided into several small groups and took our positions. We told everyone to run across as quickly as possible. The Armenian armored machines got closer and closer and then opened fire. So many innocent people died in that trap; a few lucky ones managed to escape. There were ten men in our group, and five were wounded. Only four of us had guns, so we knew we wouldn't be able to break out of the encirclement. The other survivors had already crossed the front line, and we were left behind with the Armenian military forces. If we moved, we would have to face the Armenians again. We decided to hide ourselves in a small forest nearby. We stayed there for 24 hours. Early the next morning on February 27, we decided to make a break for Agdam. We chose morning because we knew that the Armenians would be resting after the long fight, and perhaps we could pass by, unnoticed. It wouldn't be easy. We were exhausted and hungry. In addition, the weather was our enemy. Snow, frost and fog all made it difficult to travel. We didn't know the area very well, and the fog made our attempts to escape even more difficult. It took us three to four hours to get out: sometimes we would get confused and walk in circles, arriving back at the same place we had started from. We crossed the Gargar River and made it to Agdam at about 9 a.m. I went straight to the military headquarters but no one was there. I called Baku and demanded to speak to the President, but they said he wasn't there. Then I asked for the Prime Minister, then for the Chairman of the Supreme Soviet, but every time I was refused. Then I called the Minister of Defense, Rahim Gaziyev, who was in Shusha at that time. I told him about the massacre, saying that we had many casualties. Hundreds of people were killed or wounded, and many had been taken prisoner. I asked him to spread the news about what had happened. That morning I was surprised to read the Sahar [Morning] newspaper and see my name on the list of those who had been killed: Tofig Huseynov, Khojali battalion commander, Alif Hajiyev, head of the Khojali airport, and Elman Mammadov, head of the Khojali Executive Board. Another shock came when I found out that one of the state newspapers and AzTV had reported that the Armenians had attacked Khojali but were quickly and decisively repulsed by our forces. They had also announced that only men had died in the battle, not that there had been a widespread massacre of men, women and children. The population of Khojali used to be 7,000, but after the military operation began in 1988, many people had left the town. By February 25, 1992, the population was 3,000 people. Out of that number, approximately 1,100 escaped. About 1,200 people were taken prisoner or hostage. 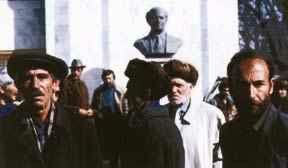 Most of them were freed a few days later-that is, exchanged for Armenians that the Azeris had been holding. Allahverdi Bagirov, leader of the People's Popular Front in Agdam, helped to get our prisoners released from the Armenians. The prisoners were kept in jails and basements in terrible conditions. Many who made it back from prison were crippled or had contracted some kind of disease. My uncle and aunt were both taken prisoner. Later they were exchanged and released, but the poor woman did not live long in freedom-she died three days later. They had given her some kind of injection while they held her. The last time any of our prisoners were released was in June 1992. Nearly 150 of the men from Khojali are still missing; we don't even know if they are alive. We've made application about this matter to all of the international organizations that deal with this kind of work. TV journalist Chingiz Mustafayev shot footage of that day. Accompanied by two military helicopters, Chingiz arrived at the massacre site. From the air, they had seen an area about 1 km across that was strewn with corpses. The pilots were afraid of landing, as the territory was still under Armenian control. When they did finally manage to land, the Armenians opened fire on them. The policemen who accompanied Chingiz in order to collect bodies and deliver them to relatives managed only to pick up four bodies. Chingiz' next footage was shot a few days later and was different from the one taken before. The signs of cruelty were more vivid the second time around. The Armenians must not have stopped their killing after the first day - they went back to the massacre site and continued their brutal deeds. If they saw someone who was wounded, they finished them off by shooting them in the head. There were examples of bodies being desecrated, eyes gouged out and heads scalped. According to the results of medical examinations, 56 of the victims were killed with unusual cruelty. Among them were women, children and old people. Some bodies showed that the victims had been scalped while they were still alive. Armenians had mutilated various body parts: heads, hands, legs, ears. Some people had been burned alive. The Amirovs - Tavakkul Amirov and his wife Khazangul Amirova - were tied to each other and burned alive in front of their three children. Mothers were forced to watch as Armenians cut off their sons' heads or threw the boys to the ground and beat them with their guns. It was a real genocide. The results of the massacre were difficult to tabulate, but we know that at least 613 people died. Twenty-five children lost both parents, about 300 children lost one parent, and eight families were totally wiped out. Of the dead, 106 were women, 59 were children and about 70 were elderly people. With the massacre at Khojali, the Armenians had set the stage for the rest of their campaign to occupy Nagorno-Karabakh. 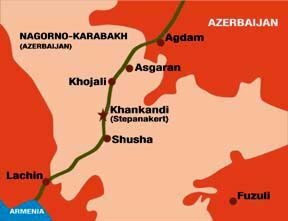 As they moved on to Shusha, Lachin, other towns inside Nagorno-Karabakh and then to regions beyond Agdam, Fuzuli and other towns and villages, Azerbaijanis fled to escape a similar fate. Hundreds of thousands have still not been able to return home. 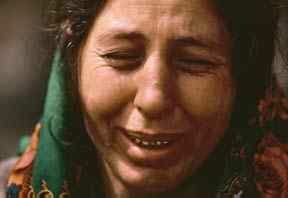 More information about the Khojali Massacre may be found on the Web at: <geocities.com/CapitolHill/5078/index.htm>.